Dan Quarnstrom has a passion for drawing and designing cars that developed from his first visit to a hot rod show in 1963. This book is a culmination of more than 50 years of passion. Other than cars, Dan Quarnstrom has created editorial illustrations for Rolling Stone before moving on to advertising illustration and visual development for films and video games. The book's 144-page hardcover with a nice maroon red cover. It's almost A4 size. This book features the customised car designs and sketches. Most look to me like traditionally drawn with pencil and ink, and the colours from coloured pencils probably and some with digital flat colours. The cars in this book looks like automobiles from the 60s except they are caricatured and further customised. There are cars with menacing huge engines that stick out from the front, boxy yet classy bodies, small front with huge back, big wheels, fire coming out of exhaust and many other interesting stuff. I like the one that jumps up like a horse standing on two legs. I can only imagine stepping on the accelerators of one of these cars. Nice. What you won't see are no sci-fi cars like those from Alien Race or The Timeless Racer or the more cartoony ones from Pixar's Cars. Quarnstrom has his own personal style when it comes to drawing cars. In addition to the artworks there is also a selection of photos collected from visits to car shows that showcases customised cars. I thought such cars only exists on paper but apparently there are actually people out there who builds them, such as Ed "Big Daddy" Roth who's mentioned as inspiration, and Dean Jeffries. Other legends includes Von Dutch the originator of modern pinstriping. 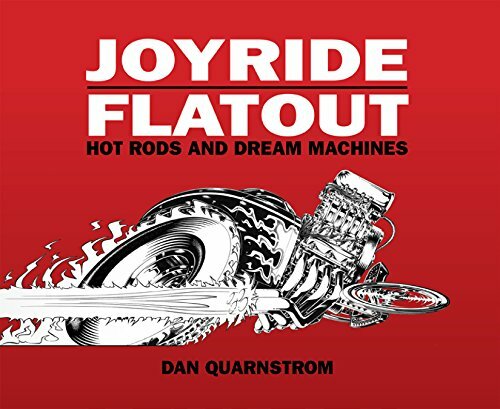 Throughout the book, there's commentary on the hot rod culture as Dan Quarnstrom has experienced over the years, and probably still experiencing. Even from the writeup, you can feel the sense of enthusiasm. In the last few pages, Quarnstrom picked three designs and talked about his process to drawing them. It's a wonderful book for those into automobile art.